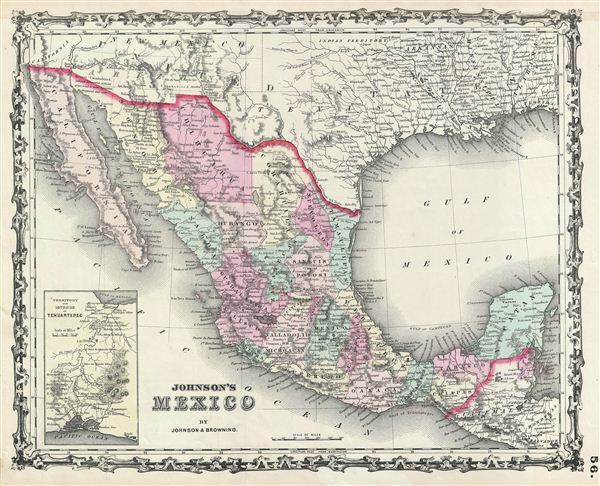 A very attractive example of Johnson's 1861 map of Mexico. Includes all of modern day Mexico as well as most of Texas, Guatemala, Belize, and adjacent regions. Color coded according to Mexican estados. Also includes some interesting notations such as 'uninhabited,' and 'isolated maintains without grass wood or waters...' An inset map in the lower left corner details the 'Territory and Isthmus of Tehuantepec' – an area of considerable international interest for its potentially easy passage, via a series of proposed canals and railroads, from the Gulf of Mexico to the Pacific. Features the strapwork style border common to Johnson's atlas work from 1860 to 1863. Published by A. J. Johnson and Ross Browning as plate number 56 in the 1861 edition of Johnson's New Illustrated Family Atlas. This is the last edition of the Family Atlas to bear the Johnson and Browning imprint. Subsequent editions reflect Ward's buyout of Browning's shares in the firm and feature the Johnson and Ward imprint. Johnson, A. J., Johnson's New Illustrated (Steel Plate) Family Atlas with Descriptions, Geographical, Statistical, and Historical, (Johnson & Browning: New York) 1861.